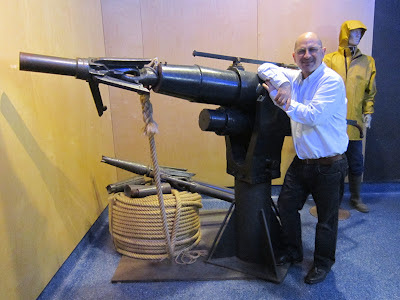 When I was involved between 1975 and 1982 in the campaign to end commercial whaling, our favourite sound-bite was “The harpoon guns should end up in museums!” So I was thrilled last month when I found in the aquarium of La Coruña, Spain the harpoon gun of IBSA III, one of the whaling vessels we’d stopped killing endangered fin whales in 1980 when I was the campaign coordinator on board the Rainbow Warrior. 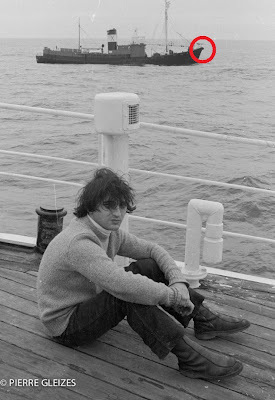 1980: This is me on the deck of the Rainbow Warrior. Thirty-two years separate last month’s photo (above) in the aquarium museum from the black & white photo (left) of me on the deck of the Rainbow Warrior in the middle of the Atlantic Ocean. IBSA III, the whaling vessel on the black & white photo was one of five whale catchers owned and operated by a company whose business was to kill large whales on their migration path approximately 170 miles off the coasts of Portugal and Spain. After harpooning them, the catchers used to tow the dead whales (generally three at a time) to two land stations on the North West coast of Spain where the meat was sliced, packaged and frozen under the supervision of Japanese operators; at regular intervals a Japanese freezer vessel called in Vigo harbour and the whale meat was shipped to Japan. We’d picked up the Spanish fleet because it was on the list of pirate whalers -- they were catching as many whales as they could, as fast as they could, and ignored completely the regulations set by the International Whaling Commission (IWC) -- and also because soon after the end of General Franco’s dictatorship Spain was hoping to accede to the European Community. So we’d figured out that if we shamed them Spain could be the first domino to fall from a series of a dozen countries making at the time big bucks (big yens) from killing big whales. That’s indeed what happened two years later: in 1982 Spain's vote tipped the balance at the crucial IWC meeting where the moratorium on commercial whaling was adopted. Spain’s whaling industry was phased out, and now IBSA III’s harpoon gun is displayed in the aquarium museum in La Coruña as the witness of a very remote era. I’m posting this story today, because the United Nations have designated the 22nd of May the International Day for Biodiversity which is dedicated this year to Life in the Sea. Of course this year is also the 30th anniversary of the adoption in 1982 of the IWC moratorium on commercial whaling. The campaign to end commercial whaling is a very old story that is still remembered as a milestone of the environmental movement. Essentially, it was a battle between very committed activists with a strong will against a large international group of old school businessmen unwilling to see that the times were changing. The campaign for the moratorium on whaling finds its origin in Recommendation 33 of the first UN Conference on the Human Environment held in Stockholm in June 1972. As we’re preparing for the Rio+20 Conference next month (Stockholm+40, in fact), should we ask ourselves what we must send to museums this time? Oil drilling gears and refineries? Destructive trawl fishing gears? Unsustainable biofuel schemes affecting food security and the environment? Aging nuclear reactors on earthquake fault lines and elsewhere? 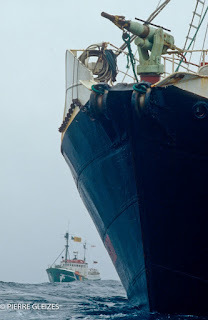 Vessels flying flags of convenience to evade financial, social and environmental regulations? 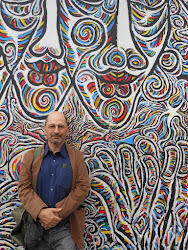 …Don’t count on governments to agree a list in Rio. But if only they put their words into action now and stop supporting with public subsidies environmentally harmful industries, for our children it could make the difference between living in a world of environmental horror or contemplating instead the museum of past environmental horrors. Let the Renaissance begin! Special thanks to Miriam Montero and Marta Cavallé of the Lonxanet Foundation for Artisanal Sustainable Fishing for arranging my visit at the La Coruña Aquarium, to Francisco Franco del Amo, Technical Director of the aquarium for his warm welcome, and to Greenpeace photographer Pierre Gleizes who kindly sent me the two photos from 1980 included in this piece. In his recently published entertaining book “Rainbow Warrior mon Amour” (in French), Pierre describes the first trip we did together in Spain as “a Tintin adventure”; Yep!